Ecosystems are composed of numerous organisms that compete with each other for a finite supply of resources. To cope with this competition, species exploit different niches to meet their needs. In some cases this adaptive process causes species to change size from their ancestors; in the case of dwarf chameleons, the benefits of small size outweigh the costs of being tiny. 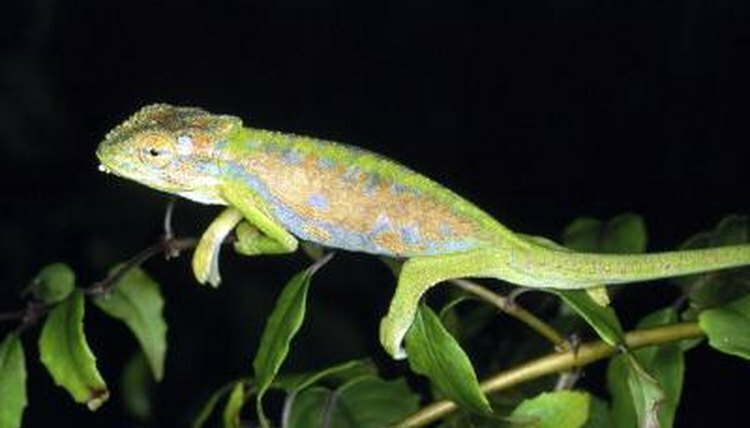 Many different chameleons carry the "dwarf" moniker, but the term is most frequently applied to chameleons of the genera Brookesia and Bradypodion. While chameleons of the genus Bradypodion are usually small, some of the larger members of the genus reach 7 inches in total length. By contrast, all Brookesia species are small, and the genus contains the smallest chameleon species in the world, Brookesia micra, which rarely exceeds 1 inch in length. Bradypodion chameleons resemble typical chameleons in most respects, while Brookesia chameleons have short tails and very small legs—earning them the moniker “stump-tailed chameleons.” In addition to these two genera, the genus Rhampholeon contains very small species as well, but they generally bear the name pygmy chameleon, instead of dwarf chameleon. Both dwarf chameleon genera exhibit largely similar lifestyles—they are ectothermic predators of small invertebrates that use crypsis—camouflage and mimicry—to hide from predators and prey. Like all chameleons, both genera are capable of rapid color change, but the various groups use this ability differently. Brookesia chameleons primarily rely on color changing for thermoregulation and crypsis, while Bradypodion and Rhampholeon chameleons use their abilities to communicate with other chameleons as well. While Bradypodion and Rhampholeon chameleons live throughout much of sub-Saharan Africa, Brookesia chameleons have a limited distribution, and are only found in Madagascar and the neighboring islands. Some scientists suspect that their incredibly small size is a result of their insular nature; island habitats frequently cause some species to evolve very large sizes while others become dwarf species. The various dwarf chameleons have different preferred habitats. While chameleons of the genus Bradypodion are largely arboreal, and inhabit trees and shrubs of the forest edge, Brookesia species are largely terrestrial, and spend their days on the forest floor, camouflaging with the leaf litter. Brookesia species may climb into low shrubs at night to sleep. Rhampholeon species inhabit a diverse array of habitats, including forests, open habitats and high-elevation mountainous forests. In general, chameleons have numerous predators; because of their small size, dwarf chameleons have even more. Birds, snakes and mammalian carnivores hunt most chameleons, but the tiny dwarf chameleons must also beware of large insects and spiders, as well as larger chameleons. Dwarf chameleons consume invertebrates such as ants, flies, small spiders and beetles. How Do Geckos Protect Themselves? What Continent Do Chameleons Live the Most On?